What is today’s image of an ideal office? Open spaces are paramount no doubt. They look like the epitome of efficient communication, collaboration, and innovation. But high-performance employees (HPEs), the backbone of businesses, vote contra. Why, and how do we work it out? Open spaces are premised on the idea that intensive intra-discipline communication, collaboration, and constant alertness are good for work. And it really might be if we are talking idea execution, an intrinsically collaborative activity in a context of a company, and complete security of the office network with a VPN for Routers. But it doesn’t seem to be the case for idea generation. And that’s what HPEs are usually busy with — they create products, strategies, and generally drive businesses. From an employee point of view, seamless communication encouraged by open spaces means that he or she needs to always be in a wait state ready to be switched from their tasks to address someone else’s questions at any moment. Innovative ideas aren’t usually born in such a chaotic environment, for their creation takes hours of uninterrupted focus, and thus solitude, calm, and predictability. HPEs’ drive in their work is, beside boosting figures, mastering their craft to excellence. Random interruptions are huge demotivators for those types of workers. In search of an environment where they can be productive, some HPEs work after hours and some work from home or while travelling. And if they can’t find such an environment, they might decide to change employers. Nearly half the US workforce already telecommute at least occasionally. Allowing telecommuting is good, but businesses need to be mindful not to compromise themselves. We are talking about cyber security, for when your employees go out of office, they go behind corporate firewalls that curb your business data from outsiders. If not properly equipped, they, and consequently your business, are extremely vulnerable to open-world dangers and data breaches. The most practical way to extend your corporate security hygiene across all telecommuting workers is employing a VPN as a part of your corporate culture. A VPN lets you connect to the internet through a highly-protected server, encrypting all traffic in transit. 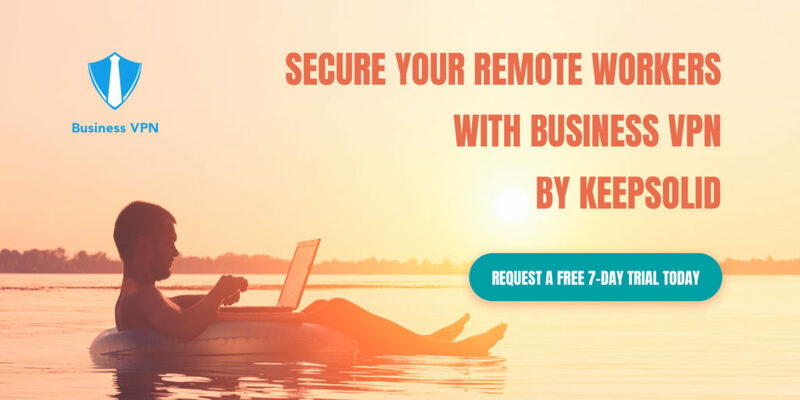 This basically creates a secure channel for your employees to connect to your business network from anywhere. This channel makes it impossible for worm-style malware to exploit open ports or intercepted data to breach your business. Every business should be using VPNs now that they became perfected and easily-adoptable. Some VPN providers take it as far as commodizing and tuning their solutions specially for business protection and management. Business VPN by KeepSolid is one such solution. It‘s made for team work, allowing managers to assign dedicated servers to teams, control group access to corporate resources, and much more. Powerful 256-bit encryption secures all your corporate communication no matter how scaled your network is. What is your policy on remote work? And how does it turn out if you do allow it? Let us know in the comments.